Winter is here and the dragons are breathing fire. After what seems to be the longest wait, Game of Thrones season 8 was finally premiered yesterday. The fans, who have been anticipating with eager eyes, were overwhelmed by the heartfelt emotions and happiness to witness the reunion of their favourite characters. And to be honest, we too were trying to hold back our happy tears! 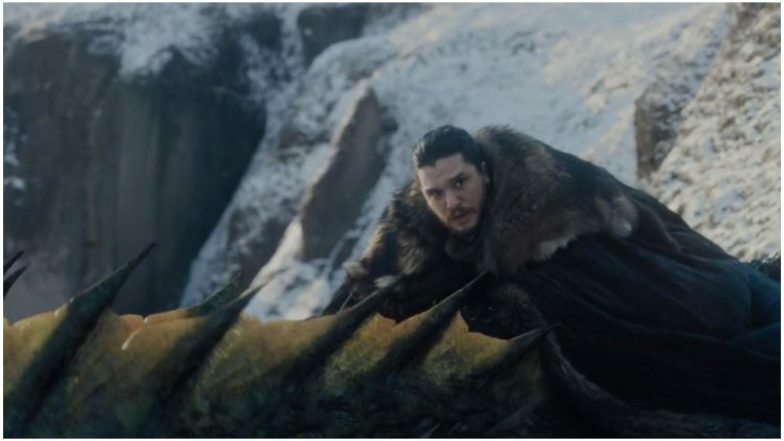 So do you remember the scene of Jon Snow riding the dragon for the first time in the first episode of season 8? Well, it was not really a cake-walk for Kit Harington to do the scene. Game of Thrones Season 8 Premiere Draws A Whopping 17.4 Million Viewers; Sets A Massive Record! In a behind-the-scenes video “Game Revealed” released by HBO, Kit explained what happened to him when he got on the buck (mechanical bull) to shoot the scene. Kit said, "Buck work is not easy. I think what sums up the buck for me was there was a bit where Jon almost falls off. The dragon swings around really violently, like this, and my right ball got trapped, and I didn't have time to say ‘Stop!' And I was being swung around." Game of Thrones 8 Premiere: All You Need to Know About Lord Ned Umber and White Walker Spiral Circle Made Behind His Corpse. As per the figures released by HBO, the premiere of season 8 drew a staggering 17.4 million viewers across all platforms. The platforms include linear, HBOGO and HBO NOW. Despite waiting for over two years for the release of the final season of GOT, the wait till the next week seems unbearable. The remaining episodes will be aired on consecutive Mondays in wee hours in India.